Saturday to Saturday. Shorter stays are possible. My unit is completely remodeled, brand new bathroom, brand new kitchenette, furniture bedding - everything is new. New window to see the ocean view. Best location on the beach! No driving on the beach in front of the building so you don't have to worry about cars while you are relaxing. Walk to the boardwalk and Ocean Walk, half a block to the Ocean Deck. If you are a repeat customer, email me for a special price. need for a great vacation including the best location at the beach. ask for more at a great price! **Please note that the balcony is small. Only 1 person can comfortably fit on it. The picture is from my balcony. Free wireless internet from anywhere in the building! On site restaurant and pool bar so you never have to leave. Kitchenette in the condo has refrigerator, microwave, toaster and coffee maker, toaster oven and hotplate. Patios and a large banquet hall make this the perfect location for family or class reunions or for any large gathering. On site laundry for convenience. We love the beach, Daytona Beach in particular and to have this hide away to stay in was a huge bonus. JANE WAS GREAT. She is a communicator. She answered all of our questions and took good care of us. All appliances worked fine. The furniture was comfortable. The tile work in the shower was very nice. The little kitchenette was great. We were very comfortable. I could only wish that we owned such a place, we would spend weeks there. We slept well with the AC turned on. 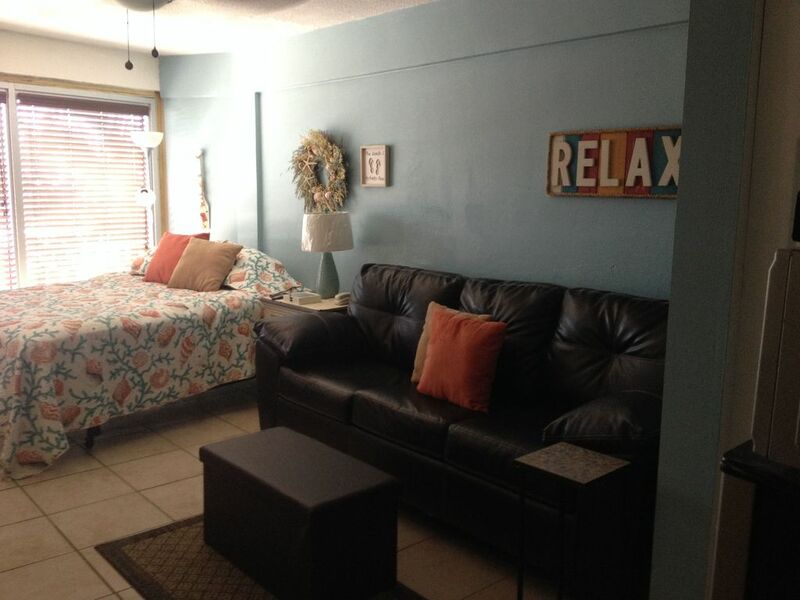 This unit is close to everything and so close to the main drive across the bridge to Daytona Beach. The rest of the resort was under renovation but it didn't affect us at all. Pay attention to Jane's instructions and you will enjoy your visit. We will be back and we are telling our friends and family about Jane's place. Jane was a pleasure to rent from and the condo is very nice with a great location. I will definitely be staying again. The unit was very clean, affordable and accessible. The construction issue was a little overwhelming, but the stay was great. This place was very nice. It was clean and in a good location. The beach was right behind the property. There were some fun bars to go to close by. Nothing really to say bad about the place. Thank you Nick. It was a pleasure having you stay at my place. Please consider me again for your next visit.